Salvation And Survival: Is Babbel A Tool To Return Us To Babel? Is Babbel A Tool To Return Us To Babel? In case you're a little confused by the title of today's post, let me explain ... Bible readers will recognize the name of Babel as a city (now thought to be Babylon) in the Plain of Shinar where God confounded a presumptuous attempt to build a tower into heaven by confusing the common language of its many builders into many mutually incomprehensible languages. Now, in the 21st Century, we have a company called Babbel that offers an online language learning software and e-learning platform available in various languages. Thirteen languages are currently offered: Dutch, Danish, English, French, German, Indonesian, Italian, Norwegian, Polish, Portuguese, Russian, Swedish, Spanish and Turkish. People from all over the world can now learn how to communicate with each other, and comprehend each others' languages. So, is there any reason to be skeptical of this latest innovation, or to be concerned in their choice of a company name? Maybe we should look behind the curtain at both Babel and Babbel. Let's take Babel first, and for that, we need to go to the Bible ... In Genesis 9:1, it says, God blessed Noah and his sons and said to them, "Be fruitful and multiply and fill the earth." Again, in verse 7, God repeats Himself, "But you, be fruitful and multiply; spread out over the earth and multiply on it." Obviously, this commandment to "fill the earth" and to "spread out over the earth" was an important part of the purpose God willed for His creation of man. But in Genesis, Chapter 11, we see that some men had other ideas. Scripture says that at one time the whole earth had the same language and vocabulary, and apparently men went to and fro across the earth. But then some of them got together and said, "Come let us build ourselves a city and a tower with its top in the sky. Let us make a name for ourselves; otherwise, we will be scattered over the face of the whole earth." Now, we see rebellion against God and His will, and a desire to exalt themselves (make a name for themselves); even to the point of climbing to Heaven and challenging God. But what is God's response? He says, "If they have begun to do this as one people all having the same language, then nothing they plan to do will be impossible for them." So what does He do? He confused their language and scattered them over the face of the earth so that they could not come together to oppose Him. Now, let's take a quick look at this new language learning software. What is it's objective? It seems benign at first glance... to make it easy within the global community to understand each other, and perhaps to become "one" with the people of the earth; no more language barriers or obstacles to working together. Could there really be any downside to that? Maybe only to those of us looking at it through our Biblical worldview. 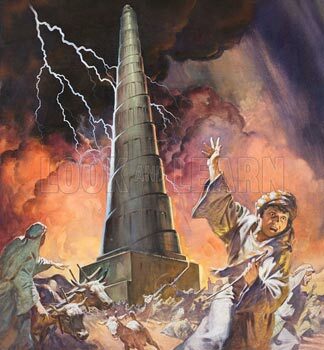 Just think about this ... what if the original city and tower of Babel were part of satan's plan to bring men together in one place, teach them the knowledge he had observed about God and His ways (before his downfall), and then collectively establish his own kingdom which would oppose the Will of God? Think how much easier it would be to convince these people that they could be 'god' in their own right, if they could all understand each other? (And notice that the devil is still peddling the same temptation as he did in the Garden of Eden -- you, too, can be like God). If satan could convince them to follow his plan, he could easily establish a tyranny where men would be prevented from knowing the Truth about God. By confusing the languages, so they could no longer understand each other, and scattering them across the globe, God thwarted that evil plan. Instead, God executed His own plan. He chose a man named Abram to become father of a nation through which His Son would be born, and in Whom the world would be called to believe through all generations. And God's Son, through His Church, which He, Himself, planted is bringing together all men scattered throughout the earth to faith in Him. So, is it just coincidence that a new language learning software is called Babbel? Or is it a signpost that, in these Last Days, there is the opportunity for mankind to erase the language barriers that God instituted, and for satan to use this technology to once again bring men together, collectively, to try and establish their own will in defiance of God? I'm at the point where I don't think anything is coincidence anymore. And nothing has really changed; the devil will always use whatever mechanisms he can to establish his kingdom here on earth. But he never learns, does he? If Babbel could ever be used to bridge the language confusion among men, then God will, once again, come down to see what is happening and make a judgment. That judgement is always the scattering of man's works, when they are opposed to Him. Only this time, it will be Jesus coming down from Heaven to judge the wicked, and it will be His kingdom that is established on earth, as it is Heaven. There will be no more confusion, clamor, or babel ... however you want to spell it. Proverbs 19:21 "Many are the plans in the mind of a man, but it is the purpose of the Lord that will stand." We must remember that God is Sovereign. What man plans for evil, God can use for good. So, you are right ... God can certainly use His discipline in one Age for His own benefit in another.